This is a kit that adventure types should keep with them. 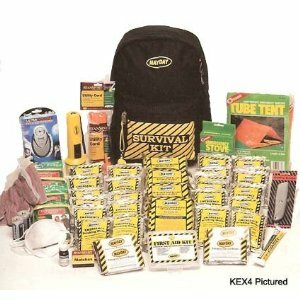 It includes the best survival and camping gear recommended, from starting fires, to cutting limbs for shelter, and to signal for help. 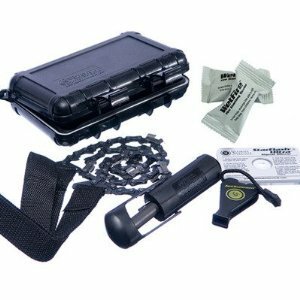 Can fit in a backpack, glove-box, ATV or boat. 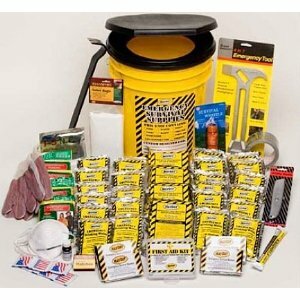 This kit is a necessity for a 4-person family or home. 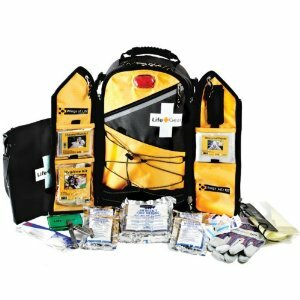 It can also be kept in cars, because you never know when you are going to be during an emergency. 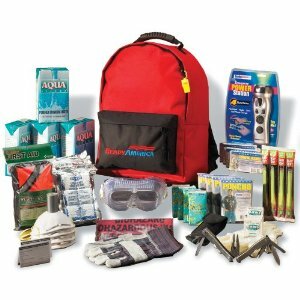 With 1 organizational backpack and 1 large backpack, this kit also provides: a 48 page How to Prepare for Any Disaster booklet; water with a shelf life of 5 years, plus 50 water purification tables; AM/FM radio/ flashlight with a rechargeable hand crank; 4 8-hour light sticks; firestarter; 4 reflective sleeping bags; 4 ponchos; 2 tube tents (2 people each); 20 hour liquid candle; 4 3600-calorie food bars with 5 year shelf life; 24 water pouches; 1 multi-tool knife, 1 5-in-1 whistle, 1 50 ft. rope; 2 pairs working gloves; 4 dust masks; 1 deluxe first aid kit; 1 hygiene kit (4 toothbrushes, toothpaste, comb, washcloth, 10 tissues, 24 wet naps, shampoo); 1 roll toilet paper; 1 note pad, pencil, and sewing kit. It also has checkless and preparedness tips. 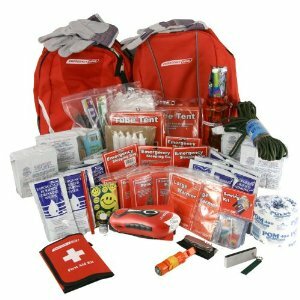 This kit comes with a deluxe hikers backpack with enough space for personal items, such as prescriptions. 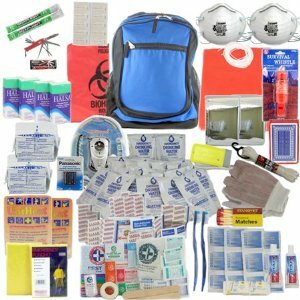 Includes: 6 pocket hiker’s backpack; 24 pouches of Datrex water (5 year life shelf); 24 200 calorie Datrex food bars; 20 Water purification tables (1 liter of water); flashlight and AM/FM radio with headphones; 5-in-1 survival whistle with compass, signal, mirror, flint starter, waterproof container, lanyard, and shrill whistle; 2 emergency green glow light sticks that last 12 hours; 1 box of 50 waterproof matches; survival sleeping bag (better than space blankets); 2-16 hour body warmers; 1-2 person tube tent with rope; 2 ponchos; 16 function knife; working gloves; 2 dust masks; 50 feet nylon rope; 2 hygiene kits including soap, toothbrush, toothpaste, and 9 wet wipes; pocket tissues; First-Aid kit. 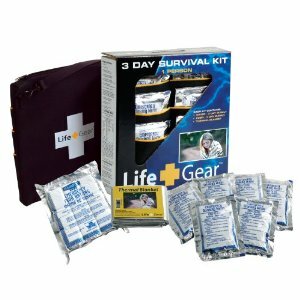 While this kit doesn’t include things like food and water, it has supplies to help survive. Such as a fire starter, a saw, and a signal. It fits perfectly in a backpack, glovebox, ATV, boat, or trunk of a car. It weighs about 1.5 pounds, so it isn’t too stocky, but can help simplify your life either every day, or on the worst of days.